Images and 3D models from the Sculptural User Interface available for viewing--New prototype in the pipeline. Recent images from the Sculptural User Interface [1-4]. July and August 2002: Matt Shaw works to develop new prototpe in Macromedia Director 8.5. Creative Capital Presentation of the state of the SUI, August 2002. 08 02 01Donald Guarnieri joins the development of the Sculptural User Interface. Donald Guarnieri has been working in the computer industry since 1984. He has also been a supporter and participant in Performance Art and Avante Garde Theatre from1988 as a board member of PS122. He has been a technical and business consultant to many corporate clients providing expertise in Local Area Networks and Wide Area Networks. He was the founder of Novent, Inc. a database application consulting company. He has co-written two books "How to Keep your Novell Network Alive" and "Netware Answers". More recently he was the network architect for the Penthouse.com website one of the most popular destinations on the Internet. Currently Guarnieri lives and breathes television licensing, Internet video streaming and Internet marketing from downtown Santa Monica. Michael Rees and Chris Burnett win funding from Creative Capital for the project "Artificial Sculpture: the Sculptural User Interface® "
Rees and Burnett win Creative Capital grant to develop software called a Sculptural User Interface®, or SUI®. 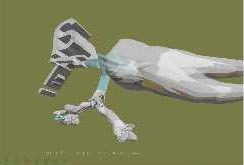 This is a software application that generates sculpture from language. It was first developed as a part of the exhibition "Artificial Sculpture" which was funded by the National Endowment for the Arts in November 1999. The Sculptural User Interface® is a new method of molding form, language, and media using sculptural objects, installation architecture and virtual reality technology. In its broadest context, Artificial Sculpture includes: a physical installation (using sets of modular connectors with various human and mechanical parts); software called a Sculptural User Interface® (SUI®), which mediates the language of the parts and their spatial assemblage. As currently developed (beta 0.1.6), the act of typing generates diagrammatic figures based on simple rules of grammar and growth. Once complete, the figures supersede the diagrammatic and suggest unique forms. Any typed construction is appropriate: a list, a poem, an essay, and so on. The SUI® builds on, and diverges from, conceptual art and sculpture in the age of electronic reproduction. There is no question that sculpture as discipline has extended into virtual space. Inevitably, online art confronts dilemnas of language-as-form and form-as-language at various levels. Here, we engage and displace Beuys' social sculpture as ideas modeling society. Initially, the project reduces social sculpture to software design and its attendent interaction. Using the SUI® creates forms that can be interactively experienced and shared across networks. We hope to broaden the design concept as a modeling dimension of virtual society. (Perhaps only one among many, but a participant none the less.) The pragmatic aspect of this proposal is the fluid interaction of information as form and form reinterpreting language. 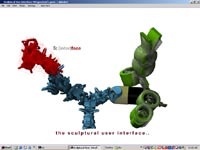 The Sculptural User Interface® is a method of molding form, language, and media using computer software, 3D virtual objects, and rapid prototyping technology. The Sculptural User Interface® (SUI®) mediates the language of the parts and their spatial assemblage.As currently developed (beta 0.1.6), the act of typing generates diagrammatic figures based on simple rules of grammar and growth. Any typed construction is appropriate: a list, a poem, an essay, and so on.